Mr Ebun-Olu Adegboruwa has withdrawn the enforcement of fundamental human rights suit he filed on behalf of incarcerated Peoples Democratic Party, PDP spokesperson, Olisa Metuh against the Economic and Financial Crimes Commission, EFCC at the Federal High Court, Lagos. In a press statement posted on his Facebook page, Adegboruwa said he was never briefed by Metuh to filed the suit and has since realised that Metuh had filed a similar case before a Federal High Court, Abuja. Below is his press statement: “On Monday, January 11, 2016, I had filed an application before the Federal High Court, Lagos, challenging the continued detention of Chief Olisa Metuh, the spokesperson of the Peoples’ Democratic Party, PDP, the leading opposition party in Nigeria. “Subsequently on Tuesday January 12, 2016, I filed an application to compel the EFCC to produce Chief Metuh in court. However, I have on January 13, 2016, filed a notice of discontinuance of the said suit. “Since filing this suit, I have received several telephone calls from colleagues, friends and well wishers, some congratulating me for the ‘fat’ brief, some criticizing me, some seeking explanations and some others commending and encouraging me. “The truth is that I have never met Chief Metuh before and I did not receive a dime from him, or from anyone else, to file the suit. I did so based upon my conviction, that it was wrong to arrest a citizen of Nigeria, lock him up in custody and be boasting that he will not be released or charged to court. “My intervention on behalf of Chief Metuh, is not to shield him from his trial, if found wanting, but rather that as the voice of the opposition in Nigeria, he should not be cowed or silenced, without following due process. “Through Chief Metuh, Nigerians have had the benefit of hearing the other side of the sweet stories of change, that the Buhari regime has been feeding us with. “I filed this case with my resources, based upon my conviction, that Chief Metuh was being unfairly treated, in the circumstances leading to his arrest and detention. It has since come to my notice however, that Chief Metuh had filed a similar application, before the Federal High Court, Abuja, late last week, but same was not made public. “Furthermore, it would seem now that Chief Metuh is finding a common ground with the EFCC, in the light of the revelations coming forth, in relation to his case and the promise to arraign him in court. I support the anti-corruption war of this administration, when it is done in accordance with the rule of law. 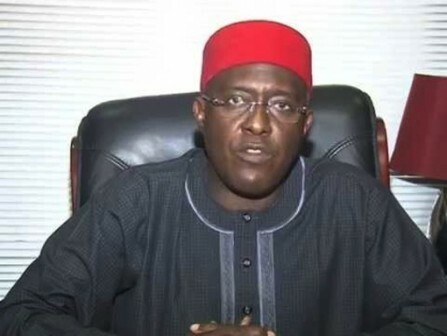 “My intervention in securing reprieve for victims of human rights abuses, is not novel to Chief Metuh’s case. For decades now, I have been partnering with civil society organisations, especially the Civil Liberties Organisation, the Committee for the Defence of Human Rights, etc, for the release of suspects in police or prison custody. “I have equally represented widows, students, retirees, fishermen, mechanics and other classes or indigent people, in court, for one redress or the other. These are not matters that I should ordinarily seek public notice or commendation, as the ultimate glory goes to God only.